WINSTED – Lisa Veaderko stopped at the Herald Journal office this afternoon to show off the Winsted Medallion she found around 2 p.m. Veaderko lives in Cokato, and works at Littfin in Winsted. 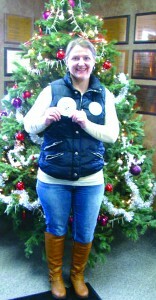 She’s got some experience in the medallion-finding area – she found the Winsted Medallion last year, too! Veaderko said following the trail of today’s clue was a little scary, since she discovered the Winsted Medallion on a fence near the police station and Winsted City Hall, and she wasn’t sure she could legally be there. But, she bravely took a quick glance at the fence, and spotted the coveted circle. Veaderko has won $100 in Winsted Chamber of Commerce Bucks for her big find. Congratulations, Lisa!